Free Wifi Hotspots are probably the most convenient way of going online in Berlin. And the good news is: there is even a fair number of free WiFi Hotspots available – at least in the inner city areas. First of all many cafes and also some restaurants are offering free internet access for their customers. Even if there is no sign or sticker saying “Free Wifi” or the like, chances are that free WiFi is offered anyways. I would recommend you just ask the service staff for “internet access” since “WiFi Hotspot” is still not a common expression in German. You can find an interactive map with all free WiFi access points on the project’s website at www.publicwifi.de. You will recognize the free access points by their name: it’s either called “30 Min Free WIFI” or “KD WLAN Hotspot+”. See also mabb.de/information/digitale-welt/public-wifi.html for further information in German. Many public libraries are now also offering internet access. As far as I know the majority is actually are also offering free Wifi hotspots, some don’t. Here you’ll find a list of all the libraries offering free internet access: http://www.berlin.de/wlan/bibliotheken/ – but beware: you will probably have to be a registered member of the library and/or of the Berlin Association of Public Libraries “Verbund der Öffentlichen Bibliotheken Berlins” (English Homepage). As of this writing (June 2016) there is virtually no Internet access in public transport – at least no free WiFi access like in Tallin or Helsinki. The Berlin’s public transport provider BVG finally recognized the necessity and tries to address the problem. Currently they are testing a free WiFi access point at one U-Bahn station: at U9 station Osloer Strasse you can currently login to “BVG Wi-Fi” and surf the internet for free while waiting for the next train. Update: The public transport provider BVG has just announced, that a couple of rather busy subway stations have been equipped with the necessary gear – and we can expect to find the hotspot “BVG Wi-Fi” in the next couple of days (July 2016). The first batch of subway stations that will be equipped with Free WiFi Hotspos are Mehringdamm, Möckernbrücke, Gleisdreieck (at U2), Alt-Tempelhof, Hausvogteiplatz, Bülowstraße, Rosa-Luxemburg-Platz and Nollendorfplatz (also at U2). In the next couple of weeks and months more subway stations will be connected. 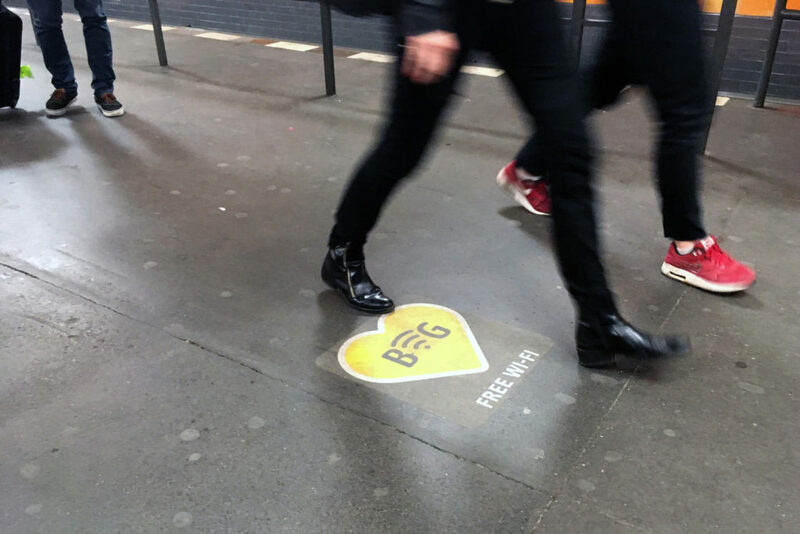 As a second batch of stations that will be connected to the internet wirelessly BVG lists the following stations: Zoologischer Garten, Rathaus Spandau, Hermannplatz, Leopoldplatz, Wittenbergplatz, Kurfürstendamm and Stadtmitte. So first the most frequented stations will be connected – other ‘smaller’ stations following later. Last but not least, after more than 7 years of planning and negotiating the City of Berlin is now finally working on free Wifi access points across Berlin. The first 100 hotspots were supposed to be up and running before the Football Euro Cup 2016, but there were actually some difficulties – of course.But it seems that at least some of the hotspots are now working. By the end of the summer (2016) all 650 hotspots should be up and running. Half of the hotspots will be located outdoors, half of them indoors in public buildings, libraries and the like. When you are near one of the free access points, you should see an ‘open’ network / hotspot named “Free Wifi Berlin” on you device. Free WiFi Berlin is basically another public/private joint venture. The hotspots will be run by ABL Social Federation from Fürth and subsidized by the City of Berlin. Main sponsor / content partner is audible. There will also be some advertisement, when you login to Free WiFi Berlin. So before you can access the internet, as far as I know some advertisement screen or actually a short video advertisement is shown. But after that there should be no time or bandwidth limit – at least theoretically. www.berlin.de/wlan ( currently German only).